We are in the middle of a drought right now here in California. How foolish if we think that the Lord no longer holds back the rain for the same reason He withheld it in the past! 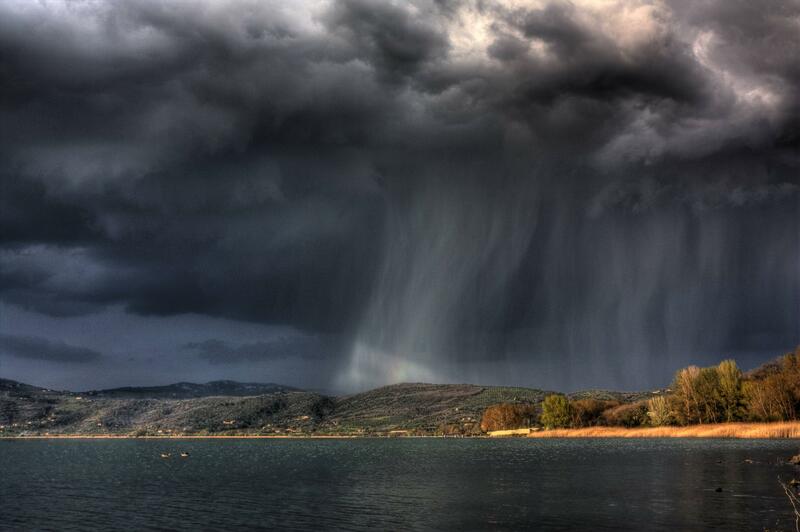 Yes, he sends rain on the just and unjust, but He is also equally able to withhold it at any time He chooses. But what I found especially intriguing about this passage was in verses 7-9 where the people plead with the Lord to help them. It is a wonderful sounding plea, also reflecting some of our own doubts and confusion about why God acts as He does. I know there have been plenty of times when I was confused by what God was doing or not doing, when it seemed He was a stranger or powerless to do anything (that, by the way, is a horrible assumption – just because He doesn’t act certainly doesn’t mean He’s powerless to do so!) Pay careful attention to the reason the people approach the Lord: they say that their wickedness has caught up with them and that they’ve sinned, but they beg for His help for the “sake of Your own reputation.” They never ask for forgiveness – they only get as far as a confession, which is short and not very convincing. They never get past the confession to asking for forgiveness and they show no inclination towards repentance. Instead, it is as if they are trying to convince God that it’s in His own best interest to just forgive them and send them rain. How many times have I tried to appeal to God’s self-interest thinking I could manipulate Him into a certain desired behavior? I’m not even sure that God can have “self-interest”! My repentance had better be real. True repentance moves the heart of God but fake repentance, even when there are lots of fine sounding words, never does. And if God’s mercies don’t rain down upon us, we will all die of the drought. PRAYER: Father, we say things hoping we can get You to “fall” for them as if You were another human from whom we can hide the truth. Lord, we have sinned against you. We ask you for forgiveness. We desire to repent from the evil we do and to experience once again the refreshing mercies that fall from Your throne of grace. In Jesus’ name, Amen. Christmas Day, 1863. America’s poet laureate, Henry Wadsworth Longfellow, found himself in a deep state of depression. America was embroiled in the Civil War, the bloodiest conflict in our history. A devout abolitionist, his heart was broken by the terrible war. But even worse, his personal grief was overwhelming. A month earlier, his oldest son was critically wounded in battle. Two years prior, his wife Fannie burned to death right in front of him, when her clothes caught fire. Longfellow was severely injured in an effort to extinguish her, and carried severe scars for the rest of his days. Through the church bells, God reminded Longfellow of the big picture; the TRUE peace that the baby in the manger brings to earth. God is not dead, nor does he sleep. He hasn’t abandoned us. The Prince of Peace still triumphs, even in the midst of war and personal tragedy, bringing peace that passes understanding: peace with God. Our world and lives today abound with conflict and turmoil. Like Longfellow, we have a choice: cave in to despair, or embrace the peace Jesus offers. Longfellow “heard the bells on Christmas day” and his life was changed forever. I know it’s the day after Christmas, but one more thing about the peace that Jesus gives: it is a lasting peace and it can fill your heart for the rest of your life. Embrace it! PRAYER: Lord, we are nearly at the new year and we pray that we will know your special peace throughout the year no matter the circumstances. In Jesus’ name, Amen. DayBreaks for 12/25/18 – What Would I Have Seen? DayBreaks for 12/25/18: What Would I Have Seen? Certainly very few people in Palestine saw and heard and understood what took place that night. The choirs of angels singing were drowned out by the haggling and trading going on in the Jerusalem bazaar. There was a bright star in the sky but the only ones apparently to pay any attention to it were pagan astrologers from the East. If anyone did see Mary and Joseph on that most fateful night, they were too preoccupied with their own problems to offer any assistance. Would I have seen and recognized the eternity shattering events in Bethlehem for what they were, or would I have let it passed unnoticed? I hope that today, you see the babe in the manger in a new light, a heavenly light that shines like none other and that you take time to worship the Incarnate One. PRAYER: Jesus, we fall silent in wonder at the events surrounding your birth. Be born in us anew this day. In Jesus’ name, Amen. Our trip to Israel had already exceeded my expectations and then I saw them. “Look! Look! Those are real sheep and a real shepherd,” I said to Dave from inside our bus. 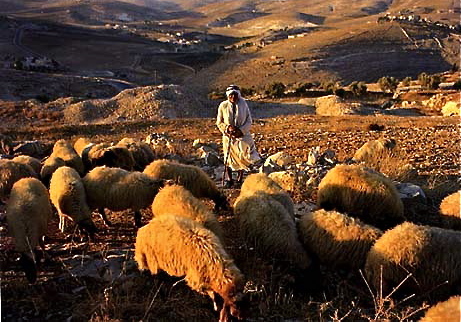 As we passed the hills of Bethlehem, they were just like I had pictured in my mind, a mixture of grass and rocks, steep for those cute little sheep and windy for a donkey to have to travel. Tomorrow I would get to visit the place where Jesus Christ was born. But in a matter of a day, the scene changed. There was some unrest in Bethlehem overnight, and it wasn’t safe to visit. I was so disappointed. I had been looking forward to this part of the trip and experiencing what it must have felt like for Mary and Joseph over 2,000 years ago. Things didn’t work out as I had expected; and almost a year later, I can still feel that disappointment. But as I thought about that, I also thought about how Mary and Joseph must have felt. Because of the census being taken, they had to leave behind everything that was familiar to them and start over in a new place. What did it feel like when they finally arrived in Bethlehem, desperately looking for a place to stay, only to be turned away? I imagine Mary was not only searching for a place to deliver her baby, but also desperately searching for relief from that pain, searching for rest and searching for help. Who of us cannot relate to those feelings in one way or another? Our lives can change in a moment, often times leaving us feeling desperate and disappointed. But if we stop there, we miss the blessings of the unexpected. Mary and Joseph continued searching for a place to stay. What did they find? A stable. Straw would become the blanket upon which Jesus Christ would be born. Not soft and comfy like the blankets on our beds, but itchy and scratchy for this tiny baby. Maybe that’s not what they were looking for, but that is what they found. Often times what we are looking for is different than what we find too. Life’s circumstances can change the way we feel. But we can’t stop there. We desperately need to keep searching for God in the midst of all we feel. While Joseph and Mary searched, they never lost hope. As a result, what did they find? They found God turned that stable into a place of glory, a place that was lit up by a star in the sky, a place where people who were desperately searching, would find hope and peace. A place for all of us. PRAYER: Thank you, Lord, for giving us a place to come and find hope and peace. Give us the courage to choose to make room for you no matter how we feel today, whether we be full of joy or full of sorrow. Help us to feel the amazing wonder of Your Son and His birth, His life and even His death. Help us to be like Mary and take the stable that was offered to her and turn it into a place where YOU, King of all Kings, would be born. In Your Hopeful name we pray, Amen. Finishing off the theme of Sacrifice for this week preceding Christmas, I’m sharing some thoughts from the message at church this past Sunday. Our fourth, and final, sacrifice as Christian priests and priestesses is found in Philippians 4:18 (ESV) – I have received full payment, and more. I am well supplied, having received from Epaphroditus the gifts you sent, a fragrant offering, a sacrifice acceptable and pleasing to God. Paul says that the gifts which were sent to him from the church at Philippi weren’t just gifts, but sacrifices that pleased God. The privilege we have as believers is that God supplies all our needs. Every good and perfect gift starts with him for our enjoyment, yes, but also to pass through our fingers into the hands of others in need. The responsibility of such a privilege is that we are empowered by his generosity to meet kingdom needs and human need. I was struck by the fact that the first gifts given to Jesus at his birth by the magi didn’t really come from the magi, but from the Father who provided it for the magi to bring to the stable. Yet, I believe that the myrrh and frankincense (and gold) the magi were sacrifices that were fragrant offerings that pleased the Father immensely as he stared down at the son in the manger – and also into the hearts of the magi. God gave the most perfect gift of all time, the most urgently needed gift, in the person of Jesus. If you have the means at all this season, you’ll give gifts to family and friends. Question: what will you give to those who may be your enemies? After all, isn’t that what God did for us with the child in the manger? PRAYER: Let us give freely, not only to those who are friends and family, but to our enemies and strangers as well. In Jesus’ name, Amen. Continuing with the theme of Sacrifice for this week preceding Christmas, I’m sharing some thoughts from the message at church this past Sunday. Though this is often a time when we receive gifts, it is also a time for sacrifices. The third sacrifice that we are called upon as Christian priests and priestesses is this: Hebrews 13:16 (ESV) – Do not neglect to do good and to share what you have, for such sacrifices are pleasing to God. It may be stretching a bit, but I think that this refers not only to the stuff we have (like money, clothes, etc. ), but also to the exercise of our spiritual gifts. You have at least one gift given to you from the Spirit. Whatever your gifts are, they are a privilege given only to believers. It’s not for your enjoyment (though usually people do find joy when exercising their gift), but for kingdom work. You may have multiple spiritual gifts. The point is this: we are expected to use them all for those in need. It pleases God. Why is it a sacrifice? Because your fleshly inclination will be not to exercise it for others – or maybe not at all. Again, as with any sacrifice, surrender is required. Our responsibility, then, is to discover, exercise and develop your spiritual gift and then to use it to do good. Questions: what are your spiritual gifts and how can you use your giftedness this holiday season to be a blessing? What are some good things you can do to share what you have, be it money, clothes, food, time or words? PRAYER: Jesus, let us not neglect to do good during this season because we’re too wrapped up in tinsel, wrappings and boxes, or even by friends and family. In Jesus’ name, Amen. Not only are we as priests/priestesses supposed to present our bodies as living sacrifices (see 12/18/18 DayBreaks), we are instructed in Hebrews 13:15 (ESV) – Through him then let us continually offer up a sacrifice of praise to God, that is, the fruit of lips that acknowledge his name. As priests and priestesses, we have a true privilege: access to God. Not everyone can call Him “Father” in the fullest sense of that word. Yes, he is the Creator of all and in that sense the one who we might call father, but only believers have been adopted into his family, giving us confidence that we can boldly come to his throne of grace in any time of need – or just because we want to cuddle up on his lap to rest. Along with every privilege, though, comes responsibility. Because we have access to him, our responsibility is to give his praise and our adoration because of that access! It started at the incarnation as the angels gave worship and praises rang through the night sky as the shepherds looked and listened wondering at what they beheld. The magi worshipped the child in the manger. Question: what special praise will you give him this week? Try to find a new reason to give him praise, a new way to express his greatness and goodness to you as you acknowledge his name. Don’t rely on tired, old prayer phrases: struggle a bit in your prayer to adore him in a new and living way today! PRAYER: Jesus, let our praises rise to you not only from our lips, but from true hearts! In Jesus’ name, Amen.